What, exactly, is a steerswoman anyway? It's an odd title, not so much for the book as it is for the character of Rowan. From what I can gather, a steerswoman is an itinerant scholar, one who has a true vocation for traveling the land, asking questions, and trying to gather (and share) as much knowledge as possible. A tradition for the steerswomen is that anyone can ask them a question, and they must answer the question honestly. In return, if a steerswoman asks a question, that question must be honestly answered, otherwise that person will be blacklisted by the entire order and no steerswoman will ever answer questions from that person again. The concept makes sense, mostly, but that is as far as it goes. 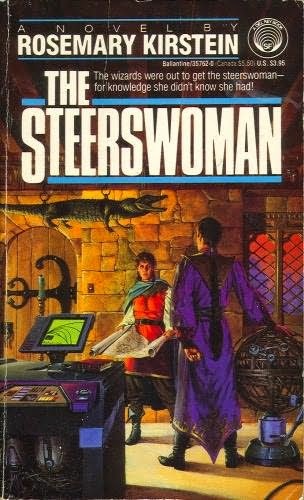 We know what a steerswoman does, and why (mostly), but as Ian Sales mentions in his review from several years ago, they are not fully explained. On the other hand, perhaps it is as simple as if someone had no concept of teachers and tried to understand parts of our society. "So, there's this organization of people who are paid by one group to impart knowledge to another group who doesn't pay them?" Of course, how do steerswoman make money? Maybe they hire themselves out when they aren't collecting knowledge. Regardless, Rowan is a steerswoman trying to learn what she can about a blue gem she found. It seems to have no use, no more than any other gem, but it is the starting point for the novel and is what appears to have the minions of a wizard intent on killing her. Wizards and steerswomen don't get along much because wizards are protective of their knowledge and their magic and tend to refuse to answer the questions of steerswomen. What's so damned cool about this book is that it is set up as a fantasy novel, but the deeper Kirstein takes us, the more we start to suspect that this might actually be a science fiction book. The initial assumptions that we make may not be at all correct. There are wizards and magic and it is clearly a low tech world, but didn't that wizard very early in the book just install streetlamps that don't require fire? And, are those really magical charms like the character thinks they are, or is it something so much simpler that the reader would understand but the characters do not? Rowan is seeking knowledge, and while she has an understanding of how her world works, she seeks to enlarge that understanding and that is the journey the reader is taken on. It is fraught with danger to Rowan's life, as well as to the lives of Bel and Will, the two traveling with her. There is action, a whole lot of exploration, but also some discovery and the use of basic scientific principles of understanding. There will be some stuff that Rowan learns that she is only beginning to grapple with the implications of which will cause the reader to stop and think, "oh, well, if that's true..." and follow that thought to the logical end. Which simply means that I must read The Outskirter's Secret and I'm going to have to keep reading after that. I had fun reading this book, waiting for Rowan to catch up with what I was figuring out and waiting for Kirstein to reveal a bit more. There are four books published in this sequence with three more planned. But, unfortunately, writing is not Kirstein's day job and these books apparently didn't sell quite enough to get Kirstein to write them faster. Despite that, I highly recommend The Steerswoman, which can also be found in the omnibus edition The Steerswoman's Road. It sounds very good, and your review reminds me why I bought it. I read this out of the omnibus edition. I just ran out of time to read the second book before needing to return it to the library. I expect I'll get the second book back sometime this summer. I only wish Kirstein was closer to finishing the series.